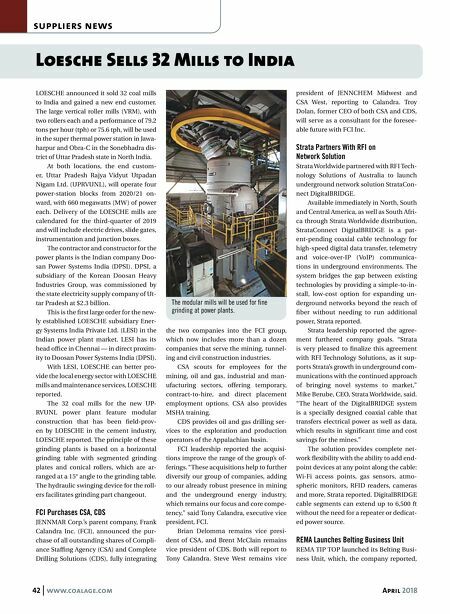 42 www.coalage.com April 2018 suppliers news Loesche Sells 32 Mills to India LOESCHE announced it sold 32 coal mills to India and gained a new end customer. The large vertical roller mills (VRM), with two rollers each and a performance of 79.2 tons per hour (tph) or 75.6 tph, will be used in the super thermal power station in Jawa- harpur and Obra-C in the Sonebhadra dis- trict of Uttar Pradesh state in North India. At both locations, the end custom- er, Uttar Pradesh Rajya Vidyut Utpadan Nigam Ltd. (UPRVUNL), will operate four power-station blocks from 2020/21 on- ward, with 660 megawatts (MW ) of power each. Delivery of the LOESCHE mills are calendared for the third-quarter of 2019 and will include electric drives, slide gates, instrumentation and junction boxes. The contractor and constructor for the power plants is the Indian company Doo- san Power Systems India (DPSI). DPSI, a subsidiary of the Korean Doosan Heavy Industries Group, was commissioned by the state electricity supply company of Ut- tar Pradesh at $2.3 billion. This is the first large order for the new- ly established LOESCHE subsidiary Ener- gy Systems India Private Ltd. (LESI) in the Indian power plant market. LESI has its head office in Chennai — in direct proxim- ity to Doosan Power Systems India (DPSI). With LESI, LOESCHE can better pro- vide the local energy sector with LOESCHE mills and maintenance services, LOESCHE reported. The 32 coal mills for the new UP- RVUNL power plant feature modular construction that has been field-prov- en by LOESCHE in the cement industry, LOESCHE reported. The principle of these grinding plants is based on a horizontal grinding table with segmented grinding plates and conical rollers, which are ar- ranged at a 15° angle to the grinding table. The hydraulic swinging device for the roll- ers facilitates grinding part changeout. FCI Purchases CSA, CDS JENNMAR Corp.'s parent company, Frank Calandra Inc. (FCI), announced the pur- chase of all outstanding shares of Compli- ance Staffing Agency (CSA) and Complete Drilling Solutions (CDS), fully integrating the two companies into the FCI group, which now includes more than a dozen companies that serve the mining, tunnel- ing and civil construction industries. CSA scouts for employees for the mining, oil and gas, industrial and man- ufacturing sectors, offering temporary, contract-to-hire, and direct placement employment options. CSA also provides MSHA training. CDS provides oil and gas drilling ser- vices to the exploration and production operators of the Appalachian basin. FCI leadership reported the acquisi- tions improve the range of the group's of- ferings. "These acquisitions help to further diversify our group of companies, adding to our already robust presence in mining and the underground energy industry, which remains our focus and core compe- tency," said Tony Calandra, executive vice president, FCI. Brian Delomma remains vice presi- dent of CSA, and Brent McClain remains vice president of CDS. Both will report to Tony Calandra. 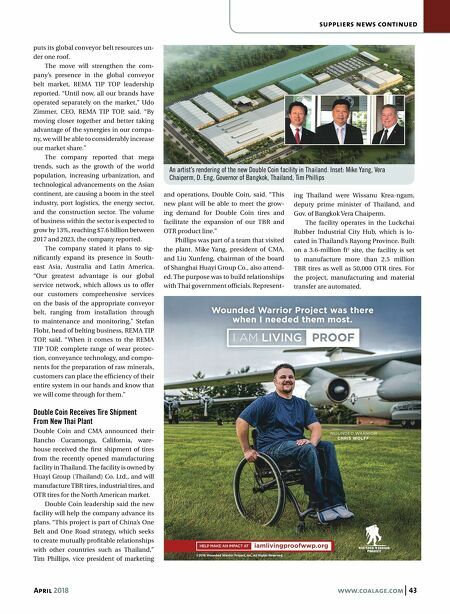 Steve West remains vice president of JENNCHEM Midwest and CSA West, reporting to Calandra. Troy Dolan, former CEO of both CSA and CDS, will serve as a consultant for the foresee- able future with FCI Inc. Strata Partners With RFI on Network Solution Strata Worldwide partnered with RFI Tech- nology Solutions of Australia to launch underground network solution StrataCon- nect DigitalBRIDGE. Available immediately in North, South and Central America, as well as South Afri- ca through Strata Worldwide distribution, StrataConnect DigitalBRIDGE is a pat- ent-pending coaxial cable technology for high-speed digital data transfer, telemetry and voice-over-IP (VoIP) communica- tions in underground environments. The system bridges the gap between existing technologies by providing a simple-to-in- stall, low-cost option for expanding un- derground networks beyond the reach of fiber without needing to run additional power, Strata reported. Strata leadership reported the agree- ment furthered company goals. "Strata is very pleased to finalize this agreement with RFI Technology Solutions, as it sup- ports Strata's growth in underground com- munications with the continued approach of bringing novel systems to market," Mike Berube, CEO, Strata Worldwide, said. "The heart of the DigitalBRIDGE system is a specially designed coaxial cable that transfers electrical power as well as data, which results in significant time and cost savings for the mines." The solution provides complete net- work flexibility with the ability to add end- point devices at any point along the cable: Wi-Fi access points, gas sensors, atmo- spheric monitors, RFID readers, cameras and more, Strata reported. DigitalBRIDGE cable segments can extend up to 6,500 ft without the need for a repeater or dedicat- ed power source. REMA Launches Belting Business Unit REMA TIP TOP launched its Belting Busi- ness Unit, which, the company reported, The modular mills will be used for fine grinding at power plants.